Samsung Galaxy Trend smartphone was launched in September 2013. The phone comes with a 4.00-inch touchscreen display with a resolution of 480x800 pixels. Samsung Galaxy Trend is powered by a 1GHz processor. It comes with 512MB of RAM. The Samsung Galaxy Trend runs Android 4.0.4 and is powered by a 1,500mAh removable battery. As far as the cameras are concerned, the Samsung Galaxy Trend on the rear packs 3-megapixel camera. Samsung Galaxy Trend based on Android 4.0.4 and packs 4GB of inbuilt storage that can be expanded via microSD card (up to 64GB). 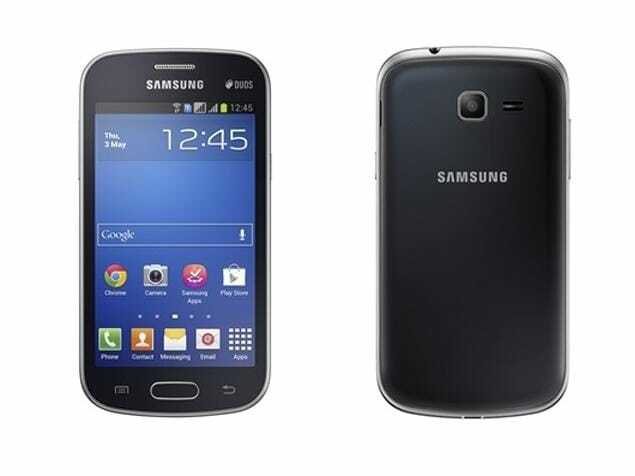 The Samsung Galaxy Trend is a dual-SIM (GSM and GSM) smartphone that accepts Regular and Regular cards. Connectivity options on the Samsung Galaxy Trend include Wi-Fi 802.11 b/g/n, GPS, Bluetooth v4.00, FM radio, and 3G. Sensors on the phone include accelerometer. The Samsung Galaxy Trend measures 121.50 x 63.10 x 10.85mm (height x width x thickness) and weighs 126.00 grams. As of 22nd April 2019, Samsung Galaxy Trend price in India starts at Rs. 4,999. Cons: 1. Only 512 MB RAM. OS not gonna work hang free on that. 2. Camera is disappointing. 3. Slow Processor. Tasks performance very bad. 4. SAmsung Touchwiz really eats into the RAM. Games hang. Here are other options you should consider 1. Nokia Lumia 520. The phone has a 5MP Camera. WP 8 Amber OS. The OS never hangs/ lags. You also get so many free goodies like Offline Maps, Nokia Music free for a year. Microsoft Office (Word, Excel Powerpoint, Office 365, Lync). At this price point thats a steal. Even for OS choosy people, try going for WP phones. You'll be impressed. If you MUST Insist on An Android option is the HTC Desire C. But given the amount of Nokia Apps and Office I don't think Desire C makes sense over the Lumia.